Also Called: Rose-pink, marsh-pink, square-stem rose gentian. Stems: Erect, 4-angled, prominently winged on edges, glabrous; branches usually 2 per node, opposite, at or above stem middle. Leaves: Opposite, simple, ovate to lance-ovate, .6 to 1.6 inches long, .3 to 1 inch wide, 3-nerved, sessile; margins entire; base rounded to nearly heart-shaped. Inflorescences: Cymes, small, few-flowered, terminal, arranged in corymbose or pyramidal manner; 20 to 50+ flowers. Flowers: Showy; stalk .2 to 1.2 inch long; calyx tube slender, .4 to .8 inch long in flower, to 1.6 inch long in fruit; sepals 5, narrowly linear, elongate; corolla wheel-shaped, about 1 inch across; lobes 5, spatulate to elliptic, 2/5 to 4/5 inch long, 1/6 to 1/4 inch wide, united near base, pink to rose or rarely white with yellow or greenish-yellow triangular spot at base often bordered by red line; stamens 5, anthers bright yellow; stigma 2 lobed. Fruits: Capsule, cylindrical at maturity, to 1/3 inch long, many-seeded. Habitat: Moist prairies and moist, open woods; sandy or peaty soils. 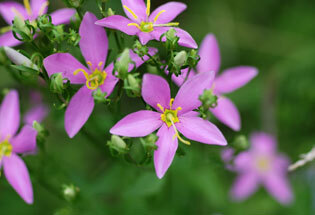 Uses: Native Americans used an infusion of the plant to treat menstrual pains. Comments: Named in honor of Liberatus Sabbati, an Italian botanist in the 1700s. Sweet-scented and long-lasting.